The Cistercians were founded in 1098 near Dijon in the Burgundy region of France. The Abbey of Our Lady of New Clairvaux was established by monks of Gethsemani Abbey, Kentucky, in 1955. In the tradition of a self-sustaining economy of our Cistercian Order, our prune and walnut orchards along with New Clairvaux Vineyard provide for our financial support. For over 900 years, you join our generous benefactors in helping monasteries over the centuries to preserve sacred traditions. Our new abbey church is open for self-guided tours starting from 2:30 until 5 p.m. Monday through Saturday. Church is closed for tours on Sundays. For guided tours or more information, please contact our Development Department at 530-839-9936 or email development@newclairvaux.org. The primary duty of a monk is seeking God. Everything at a Cistercian abbey from its buildings to the various industries of self-support should be geared toward this end. An atmosphere of silence, solitude and serenity is conducive to the monastic life. Likewise, its buildings should also say something about the God we seek. The new abbey church at New Clairvaux will incorporate a completely restored 12th-century building that was originally part of a Cistercian abbey in Spain making it the oldest building in the state of California. Our Master Site Plan includes a much-needed senior living center called the Infirmary, an administration building, a new novitiate / juniorate building, and the refurbishing of existing structures. Our Capital Campaign will begin to address these necessary areas. We welcome persons who wish to share their talents and time to support our contemplative monastic mission for God at New Clairvaux. The mission of the Volunteer Program: to invite people to partner with the monks in collaborative effort by assisting the Abbey with specific services or tasks. By complementing each other’s gifts, it is hoped to provide a service experience that is mutually enriching and beneficial to volunteers and monks alike, and build a sense of shared community. We require volunteers to be 18 years or older. Generally, after training, you should be prepared to commit to a minimum of 6 months of service. We are not currently able to consider live-in/residential volunteerships. We invite you to view the Volunteer Handbook for more detailed information about the Program opportunities and expectations. Please fill out the contact form below and we will be happy to be in touch about your volunteer interest. We thank you for your desire to aid our mission for the Glory of God and salvation of souls. As volunteers, you strengthen the efforts of our monastic community to be what our Cistercian-Trappist tradition called a "School of Charity". May God bless you! What types of volunteer services are you interested in? "To visit a Cistercian abbey is to make a voyage of discovery, but not necessarily a physical voyage. It may be an inward voyage, where one discovers a part of one's own being, an inner experience from which one seldom returns unaltered. Depending on the investment made by the traveller, it may be a brief and pleasant diversion, or it may inviate a change in the direction of one's life." ~ From Architecture of Silence by Terryl Kinder. Cistercian architecture is a 12th Century style of architecture coming from the inspiration of St. Stephen Harding, third abbot of Citeaux, and promoted by St. Bernard of Clairvaux. Cistercian monks of this period built their monasteries of smooth, natural-colored limestone with windows of clear glass and without adornment such as color, paintings, or sculpture. More than one hundred Cistercian monasteries were built in 12th Century in Europe. Of these, the monastery in Fontenay, France, constructed under the direction of St. Bernard, is considered a fine example of a Cistercian abbey. Fontenay provides much evidence of the architectural vocabulary used by Cistercians during the first century of their history as builders. Senanque, Le Thoronet, and Silvacane, all three located in Provence, are equally magnificent examples. Cistercian architecture is often considered only from an aesthetic point of view. To emphasize this approach weakens and undermines the fact that simplicity of Cistercian architecture flows from principles proper pure monastic prayer as taught by John Cassian. Viewed from a spiritual perspective, Cistercian buildings possess a stunning beauty—a sense of integrity and proportion due to the lack of excess ornamentation, images, and absence of painted color which tend to hide, destroy and distract from a building's structural essentials. Those types of details prevent the integrity and harmony of the geometry of a building from becoming its sole beauty. What gives meaning and importance to Cistercian architecture is the fact that this architecture is a product of the Order's spiritual teaching. The monk spends his entire life in his monastery, which becomes his whole horizon. If buildings bear the imprint of the Order’s and the community’s spirituality, their architecture cannot fail to exercise a formative influence on those living in them. Imperceptible as it may seem, this influence is profound. The priority of early Cistercians was to build monasteries to provide the community with an environment suited to the monastic way of life as set forth in The Rule of St. Benedict. Their monastic buildings clearly expressed their faith. They translated this Rule into spatial terms by the use of architecture. Cistercians believe prayer involves listening as much as asking, and so Cistercian architectural principles, applied either to Romanesque or Gothic, are conducive to this type of prayer, emphasizing simplicity and an inner sense of quiet. Cistercian architecture uses a combination of proportion, form, space, and light that fosters pure contemplative prayer. Its spacious, simple design without images or statues promotes a simplicity and stillness in which a monk sees a distant reflection of the simplicity and stillness of the Divine. Cistercian proportion incorporates the concept of the golden ratio. The effect on a person is that one’s spirit resonates with integration. The monks built into their buildings an effectiveness that would call forth from persons living in them a spiritual “awe.” Proportion, along with form, space, and light touch the human spirit with awe. Without elements that foster curiosity and cupidity, only an awe-inspiring sense of beauty and harmony remain. Harmonious proportion produces a sense of structural and regulated integration. The harmony coming from proportion in Cistercian architecture tends to place focus on what is authentic and suggests a centering on the true self. This direction inward, toward the true self opens the possibility for a vision of God that the true self gives. A theme in Cistercian spirituality is that a vision of the authentic self is a vision of God. Early Cistercian churches were a constant architectural reminder of heaven intimately joined to earth. Height in churches lifts the mind to God and bears witness to the teaching that the monk is not bent over but stands upright before God. The arches in the church rise up from the foundation of the earth and ascend to heaven. Often, this effect was achieved by the use of corbels and supports. The pointed barrel or groined vaulting suggests the vast vault of heaven. The visual effect was to give the impression of the upper section of the church (the church triumphant) hovering over the lower section (the church living on earth). The form of the church also expresses aspects of salvation as demonstrated by the ancient cruciform plan that symbolizes the mystery of the cross. The ample space within a Cistercian building communicates a sense of transformation along with an experience of integrity and integration. Space accents this architecture’s simplicity of form. It is more than emptiness and a blank area. It is more than a minimalist approach conducive to calm, quiet and serenity important to meditation. It is an element of Cistercian architecture essential to the “awe” experience of what God must be like. Light is another principal and prominent element in Cistercian architecture. Windows have always held a unique place in Cistercian buildings and were symbols of God both in terms of light’s coming through them and their numerical arrangement. This light is not to be understood as ordinary daylight that illumines the world, but a non-created light that existed before Creation. The windows in Cistercian churches, chapter houses, and refectories are symbols of uncreated Divine Light that Christ manifests. Round, circular windows were viewed as symbols for the divine light of Christ’s transfiguration, a vision of peace. The goal of a monk’s prayer was to see the glory of God shining through the transfigured Christ. To learn more about Medieval architecture and the role that the Sacred Stones project has in helping us better understand medieval structures, visit the October 19, 2010 NOVA episode entitled, Building the Great Cathedrals. Abbey was secularized by the Spanish Government - only 4 monks and 1 lay brother were left after monks had lived there for 700 yrs. Property went into private owners. Purchased by William Randolph Hearst for his estate at Wyntoon. He did not bring back the entire monastery, only sections of it. Arthur Byne was the art dealer whose advice Hearst followed to purchase it. Julia Morgan was an architect for Hearst, Walter Steilberg her assistant. Plans were drawn to restore it at Wyntoon. 11 boat loads of stone come to San Francisco and are stored in a warehouse near the Cannery. The Depression hit. Hearst was financially unable to reconstruct this monastery. Abbot Thomas had been in correspondence with the Director of the Museums asking for the stones over the years. Al Wilsey came to Vina to pursue the possibility of the Stones coming to New Clairvaux. It was through his direct influence and help that the Stones were awarded to the abbey and transferred here. The Board of Trustees of the Museums awards the stones to the Abbey. The legal requirements are studies and processed. The Transfer Agreement is signed by the Director and Abbot. The Abbey has 10 yrs to do “something” towards reconstruction. Ground Breaking Ceremony was held on May 1st. The Chapter House will now be integrated with the surrounding structure to form the new church for the abbey. The medieval portion of the new church is complete. 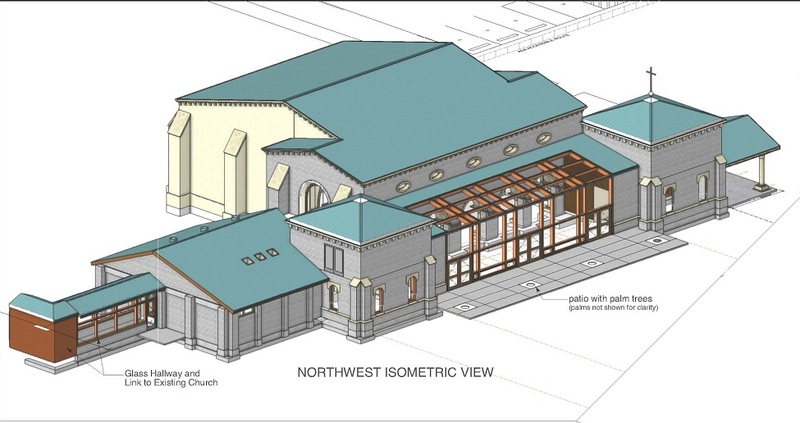 Funds are currently being raised to complete the seating area, lobby, and sacristy.